Rubble trench foundations provide a secure foundation for heavy houses, deter moisture and frost upheaval issues, save huge amounts of money, and best of all can recycle waste material. It is estimated that 3.8% of global carbon emissions are from manufacturing cement (NRMCA fact sheet). 3.8 doesn't seem like much, but in fact represents 298 million metric tons of carbon produced each year and growing. Almost any loose rubble can be used for rubble trench foundations. Urbanite (broken up concrete usually thrown in the landfill) is a great resource, but very time and energy consuming. 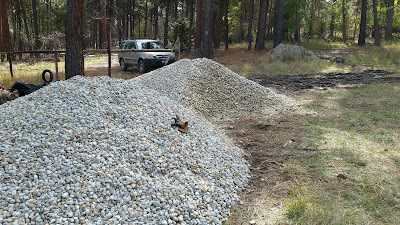 We chose to use gravel from a quarry 5 minutes away. This was a huge time saver, but definitely wasn't free. Rubble trench foundations can be much shallower than traditional cement foundations that typically must reach below frost level. Why? When properly built, a rubble trench will allow water to harmlessly flow out and away from the house, while any moisture that does freeze will expand into the many air gaps contained between gravel, thus preventing frost upheaval. The best tool utilized for natural building is your family and friends. 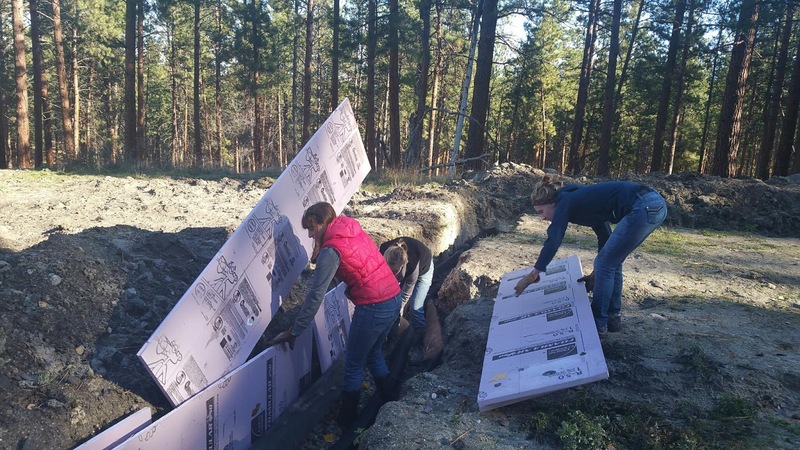 This rigid board insulation will help prevent freezing from occurring below and in our foundation. This job would have taken the two of us several days rather than the several hours when having free help. Rubble trench foundation use buried pipe to flow water out of the house's foundation. We typically use 4" diameter corrugated and perforated drain pipe. Such pipe is very reasonably priced and can be found at re-use stores like Habitat for Humanity for fractions of the cost of a new pipe. This pipe needs a place to take any water, so it needs to "run to light" and exit somewhere downhill from your building site. If building on a level plane, this pipe can end in a deep trench with adequate draining soil. 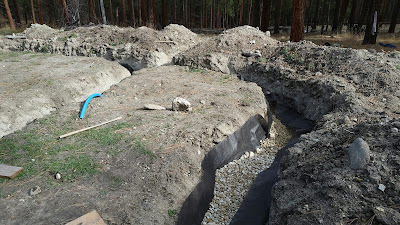 Since Montana has such little precipitation, we don't expect to see too much runoff from our foundation. Permaculture practice usually makes the most of a single system. Rubble trench foundations not only function to keep your house solid, but is useful for collecting water that would otherwise be lost to the ground. Put that water to use and make it flow to a fruit tree or two!